Housekeeping before the open beta. 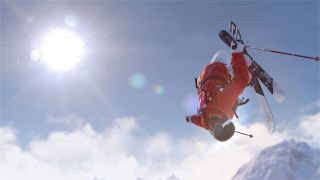 Ubisoft is having an open beta for Steep this weekend, its open world extreme sports game that has players grabbing life by the horns like in Point Break, minus the illegal activities, of course. If you're planning to partake and own a GeForce graphics card, there's a new Game Ready driver release ready, version 375.86. "Game Ready drivers provide the best possible gaming experience for all major new releases, including virtual reality games. Prior to a new title launching, our driver team works until the last minute to ensure every performance tweak and bug fix is included for the best gameplay on day one," Nvidia says, in case anyone needs a refresher. [375.70] Smearing and ghosting reported with latest NVIDIA drivers. [375.63, GeForce GTX 980 Ti] Artifacts in GIFs after driver update. [SLI, GeForce GTX 1080] Unable to enable Surround with SLI HB bridge; single ribbon SLI bridge works fine. Battle Carnival is falsely detected as Bionic Commando. [G-SYNC, 372.70, GeForce GTX 1080] G-SYNC monitor flickers at 144Hz, not reproduced with 368.81. [SLI, 372.54] Wrong memory usage values in games on Pascal GPUs in SLI mode. [G-SYNC, GP102] Periodic flickering on desktop at 165Hz when dragging or resizing windows with G-SYNC enabled. GeForce Experience icon missing on system notification tray. [GeForce GTX 980 Ti] Unable to detect multiple TV models from Loewe Technologies GmbH. There are several open issues that Nvidia is working to fix. One of them is a bug that crashes The Division Survival when changing from full-screen to windowed full-screen, which only seems to happen in Windows 10. You can download the latest Nvidia graphics driver here and view the accompanying release notes here (PDF).